Abu Dhabi: India and the UAE on Tuesday signed currency swap agreement to boost trade and investment ties between the two countries. The development came during the visit of Indian External Affairs Minister Sushma Swaraj to Abu Dhabi to take part in the ministerial meeting of the 12th session of the UAE-India Joint Commission Meeting (JCM) and held exhaustive discussions with Shaikh Abdullah Bin Zayed Al Nahyan, UAE’s minister of foreign affairs and international cooperation. 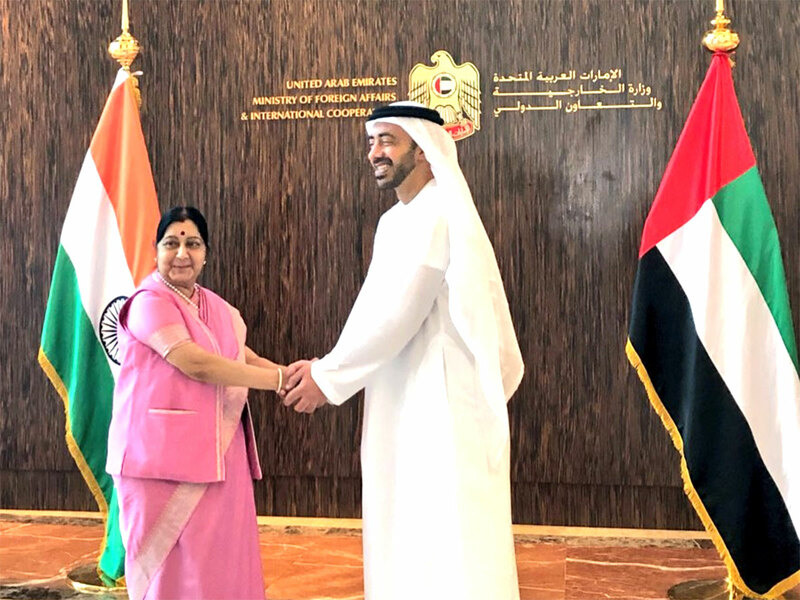 “Advancing the Comprehensive Strategic Partnership EAM @SushmaSwaraj & Foreign Minister Shaikh Abdullah Bin Zayed Al Nahyan co-chaired 12th India-UAE #JCM. Held exhaustive discussions on cooperation in energy, security, trade, investments, space, defence & consular, among others,” Raveesh Kumar, India’s external affairs ministry spokesperson tweeted. He also said two documents were signed during the visit including an agreement on currency swap and Memorandum of Understanding (MoU) for Development Cooperation in Africa. Through the currency swap agreement, both India and the UAE can make payments in their respective currency to boost and trade investment without the involvement of a third currency like dollar. Clarifying the currency swap agreement Indian embassy in Abu Dhabi said the swap is for an amount of Dh2 billion or 35 billion Indian rupees, depending on the central bank which is requesting the amount. “The bilateral currency swap agreement between India and UAE is expected to reduce the dependency on hard currencies like US dollar,” Indian embassy said. Currently there are strong economic and trade ties between India and the UAE with bilateral trade standing at $52 billion (Dh190.8 billion) in 2017, with non-oil trade accounting for $34 billion. India’s FDI into the UAE last year was $6.6 billion while the UAE’s investment in India stood at $5.8 billion. India and the UAE are also cooperating in a big way in the energy sector. Earlier this year, Abu Dhabi National Oil Company (Adnoc) and an Indian consortium led by the Oil and Natural Gas Corporation (ONGC) signed a 10 per cent offshore concession agreement giving Indian companies an opportunity to develop Abu Dhabi’s lucrative offshore oilfields, which produce about 1.4 million barrels of oil per day. Adnoc is also investing in India’s $44 billion Ratnagiri petrochemical complex in cooperation with Saudi Aramco and is exploring the possibility of storing its crude oil at Indian Strategic Petroleum Reserves Ltd (ISPRL)’s underground oil storage facility at Padur in Karnataka. “Both sides reviewed the entire scope of bilateral ties and took stock of the developments in the region. They underscored the importance of sharing views on regional and international development. Both sides further strengthened their resolve to combat extremism and terrorism in all its forms, regardless of the perpetrators and their intent,” Indian embassy said in a statement on Tuesday. The agreement on Indian rupee/UAE dirham currency swap between the Central Bank of the UAE and the Reserve Bank of India was exchanged in the presence of the two foreign ministers by Mohammad Ali Bin Zayed Al Falasi, deputy governor of the Central Bank of the UAE and Navdeep Singh Suri, ambassador of India to the UAE, the statement added.